Is this a pizza topping or is it really trash? Yum, seriously, what the heck is better than a pizza with hot cheese melted over a bed of flavorful sauce and crispy dough? Perhaps one that features a touch of toppings that are just as carefully selected as the ingredients in the pizza. Unfortunately, there are savages out there that think that they could put just about anything on a pizza. 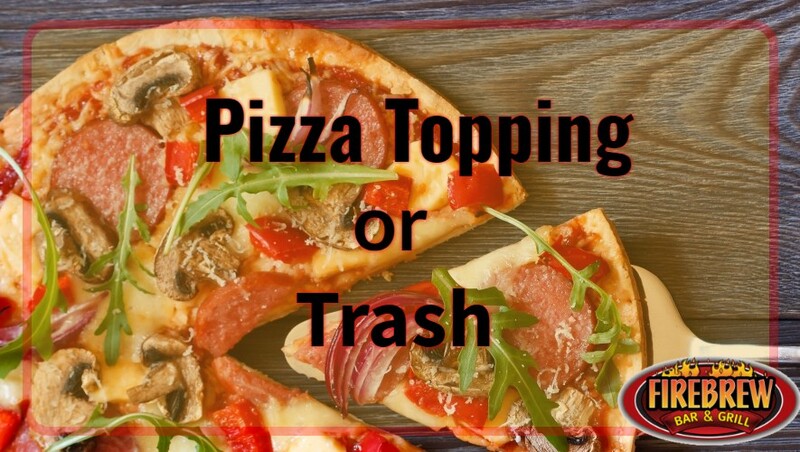 Our Virginia Beach restaurant is here to put an end to this nonsense with today’s blog post: Topping or Trash. Again, FireBrew Bar & Grill is totally cool with putting things on our pizza, as long as they’re, you know, not trash. Let’s get started. Are you joking? Hot dogs are okay in three situations: backyard cookouts, baseball games, and Chicago. That’s all. If you’re putting hot dogs on your pizza then you seriously need to reevaluate your life choices. Fresh sausage or even hamburger is okay, but only when created correctly. Don’t go trying to sprinkle a burger from the local burger joint on your pizza, please. Fresh spinach, mushrooms, broccoli, and peppers on a pizza is a great thing! And, it technically makes pizza a vegetable by association, right? Our Virginia Beach restaurant sure thinks so. Please, though, if you think veggies from a can will pass, you can’t be further from the truth, my friend. Stick to the fresh stuff. FireBrew Bar & Grill is right by the coast, so we know where our seafood is coming from. Therefore, we can get on top of shellfish as a pizza topping. However, if you’re out there in Colorado, maybe be wary of seafood on top of your ‘za. You might not feel like your best self post-consumption. Get out of here with that nonsense! We don’t care that a certain kid’s prepackaged lunch brand decided it was an a-okay idea to put rainbow candy on top of a pizza. Additionally, if you thought that scene from the Princess Diaries where the guy got a pizza with candies saying “sorry” on it was cute, it wasn’t. If we were him, we’d be even more mad. Why not use pepperoni? Or mushrooms? The horror! Part of us wants to say “ew!” but the other part of us knows that everyone deserves pizza, and not everyone is in a position to enjoy fresh cow cheese. It’s fine. Vegans and those with a dairy allergy, we’ll give you this one. No more suffering for you today. Ah yes, nothing pairs quite as well with pizza as some flavorful pepperoni or spicy sausage. Barbeque chicken is also a great option if you’re feeling saucy. All in all, as long as your poor heart can handle it, meat is usually cool. Just don’t disappoint us. If this has you in the mood for some delicious pizza, check out our menu and stop by today! We’re excited to see you!